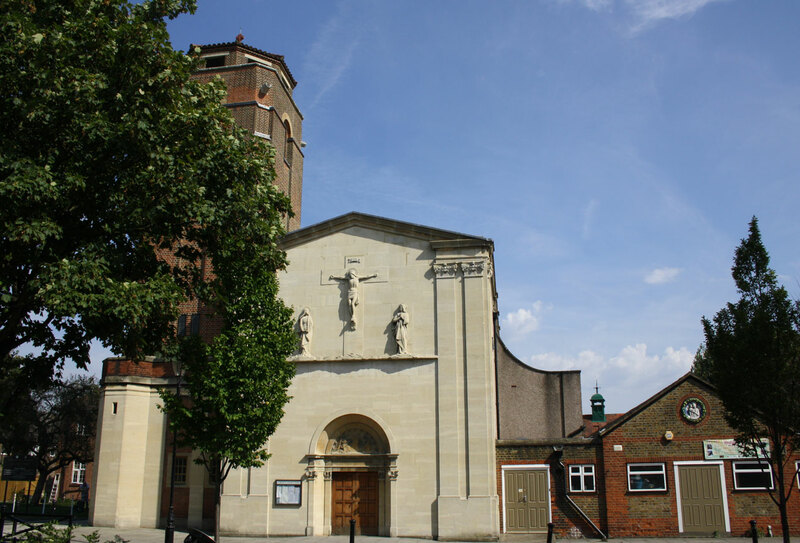 The Catholic community in Isleworth has a very long history, spanning more than 250 years but the parish of Our Lady of Sorrows and St Bridget, as we know it today, emerged in the period 1906 to 1929 under the leadership of Father Eric Green. He was building on firm foundations. He was supported by a large congregation, which included a number of influential, talented and wealthy lay people. It was at the same time socially very diverse and, like most Catholic communities in England, most of its members were poor. Father Green came to serve at Isleworth in 1906 and found a large and growing Catholic population (he estimated it at 1,200-1,300) served by a small back street chapel with a capacity of 200. There were several religious houses and a number of schools. A poor school for boys was attached to the chapel and the nuns of Gumley House provided one for girls. Gumley House also provided a convent boarding school for older girls. Father Green was an able and enterprising priest who had a gift for mobilising support. Like the Church as a whole, he gave priority to education and built a new boys' school. The confidence of the Catholic community was growing at this time and under his leadership initiatives were taken that demonstrated that confidence and a desire to engage fully in civic affairs. In 1907, he started the annual outdoor procession in honour of the Isleworth Martyrs. He went on to organize the construction of a new church in a prominent position at a main road junction on the edge of the village. The new church was consecrated in 1910. The First World War hit Isleworth hard. In all, 386 Isleworth men lost their lives. The townspeople subscribed to build the town war memorial, which is sited in the square outside the church and was designed in a style sympathetic to the façade of the church. A bell tower was added to the church in 1927 and a parish hall in 1931. Father Green died in 1929 and is buried in Isleworth Cemetery but the community and his successors have continued to build on the foundations laid in the period of his ministry. Isleworth Catholic Parish is dedicated to Our Lady of Sorrows and St Bridget of Sweden. Many parishes are dedicated to Mary, the Mother of God, either simply as St Mary or under one of her many titles. In England, few churches are dedicated to St Bridget. The reason for this unusual dedication is to be found in the history of the Middle Ages. In 1415, King Henry V chose his royal manor of Isleworth as the site for a magnificent monastery of the Bridgettines, an enclosed order founded by St Bridget of Sweden in the previous century. Syon Abbey, as it was known, was staffed by 60 nuns and 25 monks living in separate enclosures. The Abbey was a place of almost continuous worship as the nuns and monks sang the Office in shifts. It was an instrument of spiritual renewal, the monks being known for their powerful preaching and works of religious literature. The monastery was closed at the Reformation but many of the nuns stayed together and their community has survived to this day. They now live in Devon but they maintain friendly relations with the Isleworth Catholics. Although little of the monastery remains, its site being occupied by Syon House, the Isleworth Catholics never forgot it and their chapel and later their church were dedicated to the Swedish Saint who had founded the Order. Saint Bridget was a remarkable person. As a young woman, she was a wife and mother of eight children, a lady in waiting to the Queen of Sweden, a mystic and visionary. In later life she founded and led her Order, travelled extensively and was not afraid to offer prophetic advice on matters spiritual or political, welcome or unwelcome, to popes and kings. In 1923, Sweden celebrated the 550th anniversary of the death of Saint Bridget (Birgitta) who is the patron of Sweden. There was an exchange of telegrams between Father Green in Isleworth and Prince Eugen, Duke of Nark, the youngest brother of the King of Sweden, who presided at the celebrations in Vadstena where the shrine of the saint is located. In 1999, the Pope declared Saint Bridget a patron of Europe. Isleworth is home to one of the oldest Catholic communities in England. It was in certainly in existence in 1741; some sources say it began as early as 1675. The legal situation of Catholics in England up until 1778 was that they could hold their religion in private but could not practice it publicly. Places of worship, schools and religious houses were all illegal. Priests were prohibited from exercising their ministry and could be imprisoned or put to death if convicted. These penal laws were not always rigorously enforced and limited activity did continue even under these conditions. The permanent post-Reformation Catholic presence in Isleworth started in the household of the Earl of Shrewsbury. He had a mansion known as Shrewsbury House on the Richmond Road. He maintained a chaplain who ministered to the household and to local Catholics not only in the village but also throughout West Middlesex and the nearby parts of Surrey. A chapel was provided within the house. The Talbots eventually left Isleworth but the mission continued. Caution was necessary as long as the Penal Laws remained in force but the community was able to survive. In 1767, a census reported that one priest, 31 female and 28 male Catholics were living in Isleworth parish. They included nine gentlewomen, ten domestic servants, several tradesmen (two shoemakers, a cook, a carpenter, a glazier, a grocer, a tailor and a gardener) and labourers, as well as their wives and children. This represented a tiny minority of the total population. In 1791, new legislation permitted Catholics to open public chapels, subject to registration. The existing chapel was duly registered. When the main house at Shrewsbury Place was demolished in 1810, the chapel was retained. Lord Shrewsbury formally conveyed the chapel to the church authorities in 1824. The community was now growing, its numbers increased by conversions and the arrival of Irish workers and their families especially in the aftermath of the Great Famine. The mission still served most of West Middlesex. The Isleworth Catholic registers covering the period 1745 to 1835 show that the chapel served a wide area including Richmond, Brentford, Twickenham, Teddington, Kingston, Whitton, Hounslow and Southall. The social mix was much as had been reported in the census of 1767 with tradesmen and servants and their families forming the majority but with a few members of the nobility and gentry appearing too. There is a strong sense of continuity as the same names occur repeatedly spanning generations. Over the years, the proportion of Irish names increased as the migrants came and found work locally. The restoration of the Catholic hierarchy in 1850 did not immediately lead to the establishment of parishes; this was not done till 1918. As an interim arrangement, some missions were designated as rectories in which the incumbent had some security of tenure. Isleworth was one of these. In the national Census of Religion in 1851, the estimated number attending Sunday service was 80. In 1854, the incoming missionary rector, Mgr Weld, considered the chapel too small and he replaced it at his own expense with a larger chapel on the same site. The new chapel consisted of a nave and galleries with accommodation for about 200. The earlier building was retained as a sacristy. Some reduction in the work of the Isleworth mission resulted from the opening of new missions in the area - Richmond (1793), Chiswick (1853), Brentford (1856), Sunbury (1862), Teddington (1882) and Twickenham (1883). Mgr Weld himself was instrumental in founding the Hounslow chapel in the Bath Road in 1886. A survey of the religious life of London in 1902/03 revealed that the congregation of the Isleworth Catholic chapel was 339. In the district of Heston and Isleworth, the Catholics were the largest group after the Church of England with about 14% of the church attendance. Churchgoing was already a minority activity with less than 30% of the district's population attending any church service. The population of the district grew rapidly after the turn of the century and a new larger church was consecrated in 1910. With the publication of the new Code of Canon Law in 1918, existing missions including Isleworth became regularly constituted parishes. Between the Wars, new parishes were founded from Isleworth at East Twickenham (St Margaret’s) in 1931 and Osterley in 1936. The first marriage held at St Margaret's church (in April 1931) was, appropriately enough, between an Isleworth bridegroom and a St. Margaret's bride. The Society of the Faithful Companions of Jesus is a teaching order of nuns, founded in the 1820's by a French noblewoman and inspired by the spirit of St Ignatius Loyola. By 1841, the Order was already running three poor schools in the London area. The founder, Mme d’Houet, now wanted to open a boarding school in the country to attract the daughters of the ‘well to do’ who she hoped would join the Order as competent teachers. She acquired a mansion in Isleworth known as Gumley House. The sisters have been deeply involved in education in Isleworth ever since. The Catholic bishops in Victorian England were acutely aware of the deficiencies in the social care offered by the Church. In response, several new religious orders were created to provide what we would now call social services. One of them was the Poor Sisters of Nazareth whose vocation was to care for children and the elderly. By 1890 the Order was expanding and bought Isleworth House as an orphanage. They added an Industrial School for girls in a tall red brick building in 1899. The Industrial School closed in 1922 and the building was adapted for use as a home for children in need. This continued until 1985 when it was again adapted this time as a residential home for older people. In 2002, due to the decline in vocations to the religious life, the convent and home were closed. The property is to be redeveloped as affordable flats and luxury apartments. Gunnersbury House was a Victorian mansion located at the junction of Bridge Road with London Road. In 1896, its owner offered the house to the Little Company of Mary, an English foundation of sisters dedicated to the spiritual and nursing care of the dying. The Order accepted the gift and moved their novitiate to Isleworth in 1897. In time the house became insufficient for the Order’s needs and in 1922, they moved to the more substantial Hillingdon Court near Uxbridge. Gunnersbury House was sold and used as industrial premises for the next fifty years being finally demolished and redeveloped as an office block and housing in the 1970’s. A few of the trees from the former garden remain in place. This community had been located in Lillie Road, Hammersmith from 1867 in a purpose built convent. By the end of the century, the location was no longer suitable, so they sold the site and arranged for a new convent to be built near Hendon. The nuns needed temporary accommodation while they were waiting for the completion of new building. In 1899, they moved into Silver Hall in North Street, Isleworth. The Carmelites moved in 1908 from Isleworth to Bridge Lane, Hendon, where they remain today. Silver Hall itself was demolished in 1950 and its site is now a park. Until 1936 when the new parish of Osterley was formed, four other religious houses were part of the Isleworth community. The Congregation of the Missions (known as the Vincentians) was expelled from France in 1905 by the anti-clerical government. They purchased a large Victorian mansion in Witham Road, Osterley. The community of 4 or 5 priests opened their small chapel dedicated to St Vincent to the local population. Like the Vincentians, these fathers were expelled from France. They bought a house in Spring Grove which they called St Joseph’s. In 1911, the Jesuits acquired Thornbury House in Spring Grove, as a retreat house. They renamed it Campion House in 1915. After the First World War, it was used as a college for late vocations initially for men whose education had been interrupted by the war. In 1932, this American order bought a mansion adjacent to Campion House as their United Kingdom headquarters. Their chapel was open to the public. Isleworth has been a centre of Catholic education for almost 250 years. As early as 1758, a Mrs Chitty was keeping a school of some kind at Shrewsbury House and the house itself became a preparatory school for ‘boys of the Roman Catholic persuasion’ between 1770 and 1810. Founded in 1841, the boarding school attracted the daughters of the well to do and by 1855, there were 'more than 100 young ladies' in residence. Gumley House began taking day pupils in 1890, in what was known as a St Mary’s College. In 1920, the day school was reorganized as a voluntary secondary school and, in 1922, it was provided with a new building known as ‘School Block’. It became comprehensive in 1966 and further expansion followed. From the outset, the Faithful Companions of Jesus provided a ‘poor school’ for girls in their convent. In 1854, the then Rector, Monsignor Weld, opened a ‘poor school’ for boys and the following year he provided a building at his own expense next to the chapel at Shrewsbury Place. By 1881-2, both poor schools were receiving grants from the local authority. They had a combined roll of 113 pupils. In 1889, the Gumley nuns opened a mixed infants department for the poor schools. The boy's school building at Shrewsbury Place was condemned as inadequate by the local authority in 1904. Fortunately, the Misses Saunders of Silver Hall had donated to the church a large site opposite Gumley House at the junction of South Street and Twickenham Road. A new school building began in 1907 and the boys moved into it in 1908. In 1923 the Infant’s Department was integrated but the St Mary's Boy’s and Girl’s schools were not finally amalgamated until 1948. Both sets of buildings were used - those attached to the convent as the Junior Mixed and Infants, those in South Street as the Seniors - and it remained an ‘all age’ school until Archbishop Myers (now St Mark's) Secondary Modern School was opened in Hounslow in 1960. In 1962, the Junior Mixed and Infants School moved on to the former Senior School site using the original building now much extended. In 1970, the hall was built and in 1981, the Nursery Unit was added. A boys' Catholic grammar school was proposed for Isleworth in the 1920's but in the event it opened in Gunnersbury Avenue, Chiswick in 1935. The Isleworth Martyrs are Richard Reynolds and John Haile. In 1535, Haile was the Vicar of Isleworth and Reynolds was one of the monks of Syon Abbey. This was a time of the crisis for the church because the King, Henry VIII, unable to secure from Rome an annulment of his marriage to Catherine of Aragon, had bypassed Papal jurisdiction by taking the English church into schism. Determined to impose the King’s authority in matters spiritual, the royal advisers prevailed upon Parliament to pass the Act of Supremacy, which made it treasonable to speak against the claim that the King was supreme head on earth of the English church. Most of the leading figures in church and state complied, many of them no doubt taking the view that this was a short-term political expedient, but a few took a principled stand against this assault on the unity of the church. Among them were Sir Thomas More the former Lord Chancellor, John Fisher the Bishop of Rochester, the priors of three Carthusian monasteries, (John Houghton, Augustine Webster, and Robert Lawrence), Richard Reynolds and John Haile. Reynolds and the three priors were accused of speaking against the supremacy and Haile was accused of stirring up opposition to the King's policies. The government considered both offences high treason and punishable by death. All five were convicted in a State trial. The jury initially showed great reluctance to convict but eventually gave way under pressure. The priors, Reynolds and Haile were all executed at Tyburn on 4 May 1535. Fisher and More were condemned and executed later in that year. The annual procession and pilgrimage in honour of the Isleworth martyrs was started in 1907 by the then rector, Father Eric Green. The procession was a demonstration of the growing confidence of the Catholic community and of its acceptance in the district. Hundreds of people joined the procession, which followed a route from St Bridget's church along South Street, Church Street, Park Road and Twickenham Road to Gumley House, passing places associated with the lives of the martyrs. In Church Street is All Saints' the historic parish church of which John Haile was vicar; in Park Road are the gates of Syon Park, the site of Syon Abbey where Reynolds spent his religious life and near Busch Corner was the crossroads where two other martyrs had been put to death in 1588. The procession was a grand affair with representatives of all the local Catholic parishes, bands, local church organizations and guilds, Scouts and Guides, men carrying statues of the martyrs shoulder high on wooden cradles and schoolchildren in white each carrying a bead of a giant rosary made of wood and painted gold. The police halted the traffic and the local population turned out to watch the spectacle as it passed. It was cited in the canonization process as evidence of strong local devotion to the martyrs. It continued until 1970 by which time the canonization of Richard Reynolds had been achieved. The parishioners celebrated the canonization with a pageant based on events surrounding the martyrdom. Work on a new and impressive church began in 1907, on the site opposite Gumley House at the junction of South Street and Twickenham Road adjacent to the new boys’ school. The last service in the old chapel was held on Sunday May 2nd 1909. On Monday May 3rd, there was a candlelit procession up South Street from the chapel to the new church, followed by the blessing of the new building. The Archbishop of Westminster formally opened it on the 4th and after the ceremony, there was a luncheon at the Public Hall for 150 people. Consecration followed in 1910. The church is in the Italian renaissance style. It was built to the design of F. Doran Webb by Messrs Erwood and Morris of Bath. Through the generosity of two laywomen, the church was built free of debt. Miss Saunders of Silver Hall had given the land and Mrs McDonnell of Nazareth House paid for the building. It is of brick and stone construction. The stone is oolitic limestone from a quarry near Bath. The bricks are of a bright terra cotta colour but, unfortunately, they are porous which led to the decision in the 1970s to clad the brickwork in roughcast. The roof is flat. The street facade has a large low-relief sculpture of the Crucifixion and in the arch over the front door is a relief depicting the Annunciation. The altar and baldachino (the canopy over the altar representing the tent of the Ark of the Covenant) were made in Italy. In the side chapels on the south side are sited statues of St Anthony of Padua (disciple of St Francis of Assisi and friend of the poor), the Pieta (illustrating the sorrows of the Virgin Mary), St Bridget of Sweden (patron of this church, of Sweden and of Europe) and the altar of repose used during Holy Week. On the north side are the baptismal font, the memorial and statues of the English Martyrs (including St Thomas More, St John Fisher, Isleworth's own saint Richard Reynolds and Blessed John Haile) and a war memorial. The tower is a later addition. In all, 386 Isleworth men were killed in the First World War. Fifty-three were Catholics, many of them of Irish origin. Notable among them was Sergeant Harry Shea of the Grenadier Guards. He was a professional soldier whose parents lived in Worton Road. He was killed in the fighting around Ypres in 1914 and having no known grave is commemorated there on the Menin Gate. He left a young widow, Hilda, who was only 22 when he was killed. Fr Green was a naval reservist and was called up in 1915 to act as a chaplain to the Royal Naval Division in Gallipoli and France. Contemporary accounts lay stress on the ecumenical spirit engendered by the shared adversity of war. Fr Green’s experiences led to him being instrumental in the formation of the Isleworth British Legion after the war. The Catholic community was also closely involved the construction of the town war memorial which was dedicated in 1922 and has recently been restored. The war was not all loss; one of the former pupils of St Mary’s School, Andrew Edwards, won the Military Medal for gallant service. Percy House, part of the Brentford Union Workhouse complex (now West Middlesex Hospital) in the Twickenham Road, was used as a military hospital during the war. Nearly 5,000 wounded soldiers were treated there, all but one recovered from their injuries and two votive plaques in the church bear testimony to recoveries made in 1916 and 1917. When the new church was designed, provision was made for a bell tower. The foundations and ground floor structure were provided in the original construction adjacent to and north of the façade. In the event, the tower was not built until 1927. The bell is dedicated to the Archangel Michael. It is a memorial to two late Victorian writers, Katherine Bradley and Edith Cooper, aunt and niece, who were prolific authors of poetry and verse drama under the joint pen name of Michael Field. They were inseparable companions who lived, wrote, and travelled together from 1887 until their deaths in 1913-14. Their spiritual journey took them from the Church of England, through paganism and aestheticism to Catholicism. They were received as converts into the Roman Church in 1907. Although they lived in Richmond, they often attended St. Bridget’s church and were friends with Father Green. Miss Bradley was a regular visitor to patients in the consumption wards at the workhouse infirmary in Isleworth. When she died her will included a gift of £400 ‘for the poor of Isleworth’ to be distributed by Father Green. The construction of the bell tower at St Bridget’s provided the opportunity for an appropriate memorial. The Auxiliary Bishop of Westminster blessed the bell in an elaborate and dramatic traditional ceremony on January 11th 1927. The bell has recently been restored and ‘Michael’ is again heard in Isleworth. Sing, Michael, in the presence of God forever. Like the flower in the field, so man has wept for a short time; soon the voice of Michael from Heaven shall rouse (him) from death.